Bellator MMA doesn’t boast the super deep roster that the UFC does, but that doesn’t mean it can’t present action-packed and intriguing fights. At Bellator 184, two of the best bantamweights that you may not know will step into the cage. 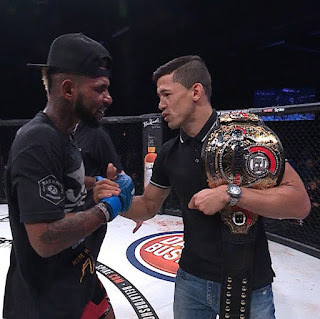 Eduardo Dantas defends his 135-pound title against Darrion Caldwell, and for those who enjoy technical and dynamic mixed martial arts, this is a fight to see. At 28 and 29 years old respectively, Dantas and Caldwell represent two of the best and most talented younger fighters within the Bellator promotion. Dantas’ resume speaks for itself, as he’s put together a 10-1 record in the promotion that includes wins over the likes of Joe Warren, Marcos Galvao, and Wilson Reis. His one loss came to Warren at Bellator 128, a defeat he was able to avenge at Bellator 166. Dantas is widely considered one of the top bantamweights outside of the UFC, and his performances continue to prove that point. Caldwell is surging on that very same list. “The Wolf” boasts a 10-1 professional record since emerging in the sport in 2012. He joined Bellator in 2014 and has quietly climbed the ranks. But it was his win over Warren at Bellator 151 that caught the eye of those in charge of the division. The huge suplex to rear naked choke finish of Warren put the division on notice, and many expected him to rise to the title shot. Joe Taimanglo had something to say about that, but Caldwell eventually passed that test to help him reach the position he is in today. Caldwell is a very aggressive wrestler that has shown the ability to take his opponents to the mat in a variety of ways. Of his 10 wins, four have come via submission, most set up by his takedown and control abilities. But while the ground may seem like an area of clear advantage for the New Jersey native, Dantas isn’t a fighter to be trifled with there. The Nova Uniao standout Dantas knows how to finish a fight -- he has four knockout wins and six due to submission. However, he hasn’t submitted an opponent since Anthony Leone at Bellator 111. Warren was able to take advantage of Dantas falling in love with the striking game and use his wrestling to score at key points in their bouts. Expect Caldwell to look for the same opportunities. That said, Dantas has steadily improved his takedown defense and is very active off of his back. He also does a great job of moving his hips to create space and get back to his feet, so Caldwell can’t expect one takedown to be enough to hold the Brazilian in place for an entire round. Caldwell vs. Dantas creates an interesting matchup with a number of factors worth watching for. Judging should play a particularly important role., as both men have the ability to fight a strategic battle, and with the title on the line, that should be expected. If Caldwell has success with his takedowns, the way the judges see the action on the floor play out will determine the way they score the bout. In particular, the judges will need to be able to properly score activity from the back, as Dantas may find himself in that position on Friday night. Great fights should not be missed, regardless of the promotion. Eduardo Dantas and Darrion Caldwell are two of the top names in the 135-pound weight class. Their pairing this Friday at Bellator 184 is a great example of the action available outside of the Octagon, and even if you barely know their names going into this bout, you're sure to know them after it.